The Boundless Thicket: Does Green Tea Help You Lose Weight? I had never tried tea before until few months ago when my roommates introduced it to me. As a kid, I was never allowed to drink tea. My parents always stopped me from trying it saying that tea is not meant for kids. However, after my roommates introduced tea to me, I fell in love with it, more so addicted to it. My tea intake had increased to 3 cups per day. Realizing how much sugar and other unhealthy ingredients I was consuming, I decided to start drinking tea with some health benefits. 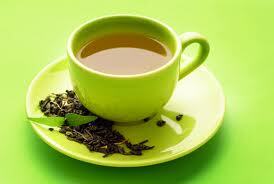 I heard about and read several articles on the health benefits and potential weight loss properties of green tea. However, I wasn’t sure if it was just a myth or was actually true. I wondered: How exactly does green tea help you lose weight? What ingredients in it can help you lose weight? 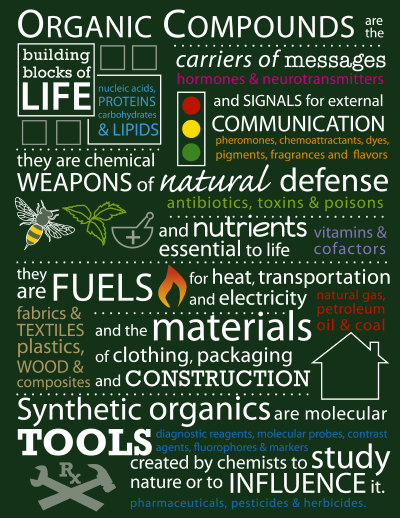 What is the mechanism of action of green tea? Are there any data that support the claim? Fortunately, Google Scholar helped me solve my unanswered questions. I typed in a few key words, i.e. “Green tea and weight loss,” and came across an article published on January 4th, 2007 titled, Green Tea Extract Thermogenesis-Induced Weight Loss by Epigallocatechin Gallate Inhibition of Catechol-O-Methyltransferase by Q. Shixian et al. I found the article to be very detailed and informative. The abstract indicated that green tea extract, especially epigallocatechin gallate, helps in weight loss by increasing “diet induced thermogenesis” which can stimulate energy expenditure and fatty acid oxidation. The data shown in Table 1 indicates the energy expenditure of people who were given green extract (50 mg caffeine + 90 mg EGCG), caffeine (50 mg), and placebo. Dirunal energy expenditure is the energy expenditure during the first 12 hours of the day and nocturnal is the last 12 hours during the night. Caffeine was included as one of the controls to exclude the possibility of its effects on weight loss. The data shows that relative to placebo, treatment with green tea resulted in a significant increase in 24 hr energy expenditure (4%). Treatment with caffeine did not show significant increase in energy expenditure indicating that caffeine content of green tea doesn’t result in an increase in energy expenditure. From the article, I learned that these data came from a study performed by Dulloo et al. The study was performed on 10 healthy men who were randomly assigned one of the three treatments mentioned above over the course of 6 weeks. The subjects took 2 capsules of their respective doses 3 times per day. I wondered how this experiment was performed to measure the energy expenditure so I linked to a cited reference which brought me to an article published on December 1999 entitled, Efficacy of a green tea extract rich in catechin polyphenols and caffeine in increasing 24-h energy expenditure and fat oxidation in humans by Abdul G Dulloo et al. I learned that the subjects were placed in a respiratory chamber and their energy expenditures were measured using an indirect calorimetry that measured the difference in O2 and CO2 contents between the air that left the chamber and the air that entered the chamber. Now I know that green tea can increase energy expenditure; but what about fatty acid oxidation? The study mentioned in the article written by Dulloo et al. showed that green tea helps to increase fatty acid oxidation too. These researchers also measured respiratory quotients using indirect calorimetry, protein oxidation using urinary nitrogen, and carbohydrate and fat oxidation using the respiratory quotient. The data presented in table 2 shows that compared to placebo, the study group that received green tea supplement noticed a decreased in their respiratory quotient. The data presented in Table 3 indicated that there wasn’t any change in protein oxidation after consumption of green tea. While carbohydrate oxidation decreased, fatty acid oxidation increased upon the consumption of green tea compared to placebo. The researchers concluded that because protein oxidation across all the groups did not indicate any significant differences, lower respiratory quotients during the treatment with green tea were due to the utilization of substrates that favor fatty acid oxidation. However, I wondered why a decrease in respiratory quotient correlates to an increase in fatty acid oxidation? The researchers never explained this. Was it assumed that I would know this? Are there any theoretical respiration quotients for carbohydrate, protein, and fatty acid? I decided to do my own thinking. I googled “respiration quotient” and found out that respiration quotient is the ratio of the amount of carbon dioxide produced to oxygen consumed, and the respiration quotient for carbohydrate is 1, 0.7 for fatty acid, and 0.8 for proteins. Next, I tried to recall information from my biochemistry class to figure out how the respiratory quotients were derived. I knew that during the oxidation of glucose, 6 molecules of CO2 are consumed and 6 molecules of O2 are formed. Hence, using the equation for respiratory quotient, 6CO2/6O2, you get the ratio of 1. The overall equation for fatty acid oxidation is C16H32O2 + 23 O2 → 16 CO2 + 16 H2O. Thus, the respiratory quotient will be 16 CO2/23 O2 = 0.7. Finally, the overall equation for albumin (protein) oxidation is C72H112N18O22S + 77 O2 → 63 CO2 + 38 H2O + SO3 + 9 CO (NH2)2. Thus, a respiration quotient of 0.8 (63 CO2/77O2) is obtained. Now that I knew how the respiratory quotients were derived, the results obtained from the study conducted by Dulloo et al. were easier to understand. The approximate respiration quotient for people who consumed green tea extract was approx. 0.852 as compared to placebo, 0.881. This value is close to the theoretical respiration quotient for protein. 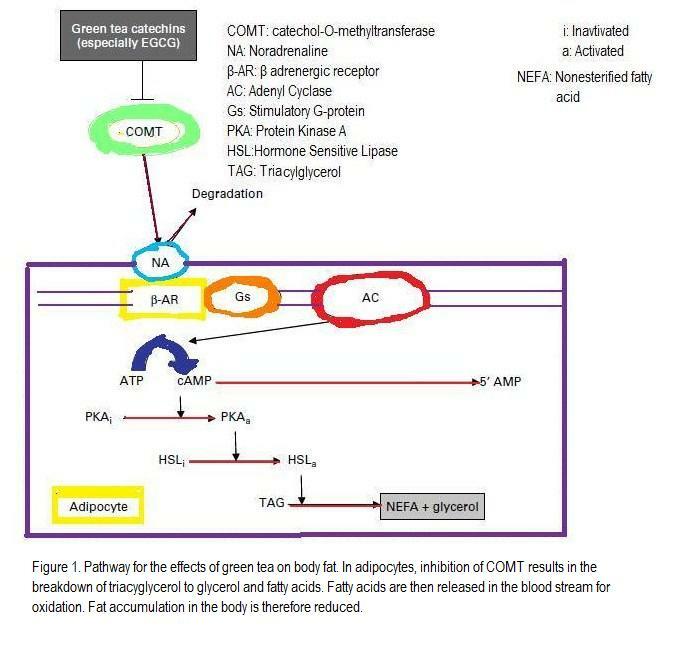 However, as the protein oxidation didn’t change significantly after the consumption of green tea, and as the theoretical respiration quotient for carbohydrate 1, it can be concluded that fatty acid oxidation increased upon the intake of green tea. Amazing results. I can share these with my friends and motivate them to switch with me from black to green tea. I now actually had proof that green tea can help with weight loss. However, I was still curious to learn about the mechanism of action of green tea. I therefore decided to dig deeper into the topic. The article by Q. Shixian et al states that green tea polyphenols are known to display inhibitory activity over the enzyme catechol-O-methyltransferase (COMT). This enzyme degrades neurotransmitters such as norepinephrine through methylation. Neurotransmitters like noradrenaline are key players of the sympathetic nervous system which is mainly responsible for the stimulation of fat oxidation and thermogenesis. Thus, inhibition of COMT by epigallocatechin gallate would result in an increase in fatty acid breakdown because the concentration of available norepinephrine in the synaptic cleft of the nerve terminal would increase, which would consequently lead to an increase in alpha and beta adrenergic receptors activation on the post synaptic cleft of the nerve terminal. Moreover, the article by Dulloo et al further mentions that the activation of beta adrenergic receptor leads to an increase in cAMP. An increase in cAMP activates the protein kinase A enzyme cascade which eventually activates hormone sensitive lipase. Hormone sensitive lipase would in turn result in the breakdown of fatty acids. I now have a better understanding of how green tea works on our body and mediates the breakdown of lipids. After all, the things that I heard about and read on green tea and its ability to help with weight loss were not fake. The experiments and clinical trials conducted on people strongly suggest that green tea does seem to aid in the reduction of fat. Now the final question is the potential of green tea. From the research that I conducted, I found out that although green tea has potential weight loss properties, one would have to drink large quantities of green tea every day to see the effects, approx. 10-12 cups. For that reason, unless a person plans on taking green tea pills, with high amount of epigallocatechin gallate, expecting weight loss just by drinking tea might not be very realistic. However, I might just switch to green tea since it is healthier than black tea, and hope that the effects pile up over time. · Q. Shixian, B. VanCrey, J. Shi, Y. Kakuda, and Y. Jiang. Journal of Medicinal Food. Winter 2006, 9(4): 451-458. doi:10.1089/jmf.2006.9.451. · Dulloo AG, Duret C, Rohrer D, Girardier L, Mensi M, Fathi M, Chante P, Vandermander J: Efficacy of a green tea extract rich in catechin polyphenols and caffeine in increasing 24-h energy expenditure and fat oxidation in humans. Am J Clin Nutr 1999; 70:1040–1045. · Thavanesan N. The putative effects of green tea on body fat: an evaluation of the evidence and a review of the potential mechanisms. Br J Nutr. 2011 Aug 3:1-13. doi:10.1017/S0007114511003849. Binnie, besides for the epigallocatechin is there anything else in the green tea that helps with weight loss? Does the caffeine have anything to do with it? Is there anything beneficial in drinking just black tea? Do you think weight loss pills have some sort of green tea in them? Your article was very interesting and I think that I will try to start drinking more green tea as well. Great post! I found your topic very interesting. Similar to what you mentioned, I had heard that green tea can help with weight loss but always wondered how it is beneficial for one's health. After reading your post, I now understand that green tea extract stimulates fatty acid oxidation and energy expenditure. Moreover, your figure of the mechanism of action of green tea helped me visualize the way green tea works in the human body. Finally, I like how your closing paragraph discusses that the benefits of green tea have been supported by research, but that the weight loss effects are seen when large amounts of green tea are consumed. You help the reader understand that he or she shouldn't expect weight loss results simply by drinking a cup of green tea each day. Binnie, I found your post to be very interesting! I have always heard that tea has many health benefits, and as a coffee drinker I often wonder if it would be more beneficial for me to start drinking tea. 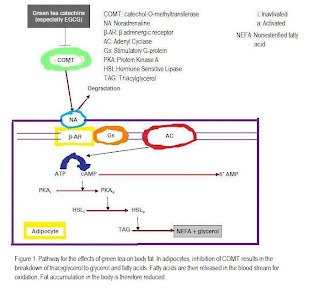 Your discussion about fatty acid oxidation really helps make the connection between green tea consumption and weight loss, and you do a really excellent job at explaining the biological and metabolic processes. Your last paragraph makes me wonder about how epigallocatechin gallate might potentially be able to be used as a weight loss supplement, or maybe it is already. That would be something interesting to look into! You can lose weight by following some very nice and easy tips. I personally found them very beneficial. If you want to have a look at them just click here. . Very informative post about herbal remedies. Looking forward to more such posts in future. I have gained much weight and I need to decrease it. So i am using Body Slimming Tea and get effective result. Yeah, that’s true that many Green drink supplements are good for weight loss and give good stamina to our body. Even I also used green tea for my weight loss process. An outstanding share! I've just started homework on it, i personally found weight loss tea is very beneficial, with regular use of Best Weight Loss Tea, you can loose weight and improves digestion also. It's great thing for weight loss with green tea. Thank you so much for this helpful article about matcha tea,. This is something really amazing and helpful post,. One of the best share about tea,.